Championships, Alumni networking, 2020 Champs location and more! Hi, just a reminder that you're receiving this email because you have expressed an interest in National Collegiate Table Tennis Association (NCTTA). Don't forget to add info@nctta.org to your address book so we'll be sure to land in your inbox! NCTTA welcomes "iSET Network Development", as the new title sponsor of the NCTTA finals. iSET is a new startup Canadian company involved in sport entertainment technology development. 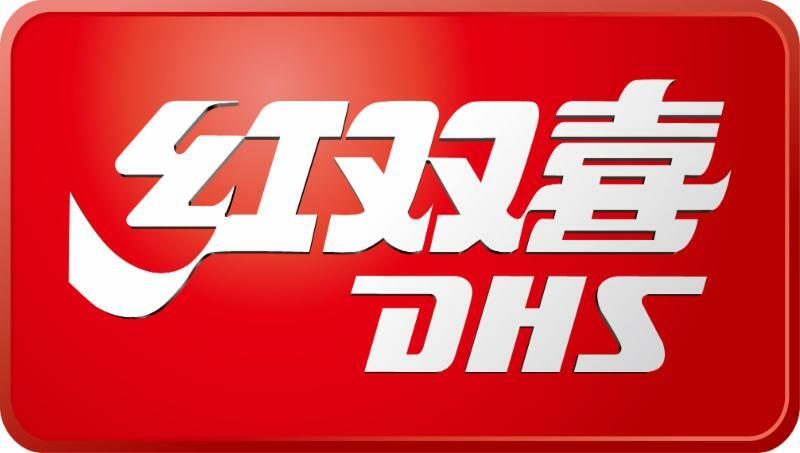 NCTTA welcomes Double Happiness as the official table sponsor of the iSET College Table Tennis Championships. 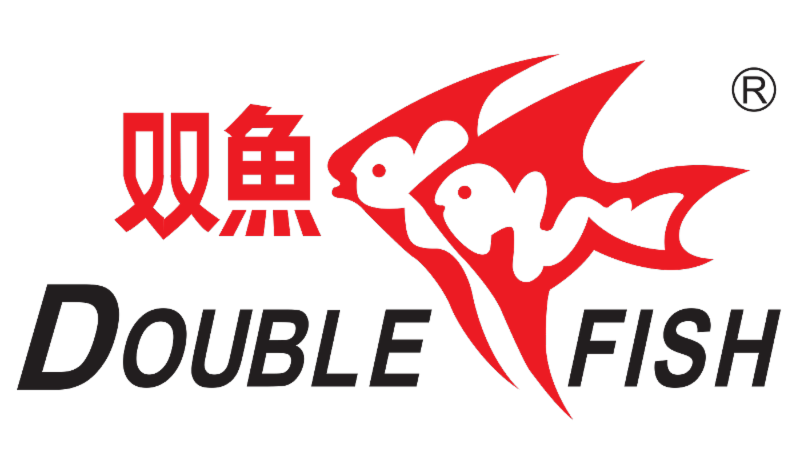 NCTTA welcomes Double Fish as the official ball sponsor of NCTTA competitions. The National Championships, whether you are a singles player or teams player or both, is a special time for College Table Tennis! We also want to very much make sure that all the information and deadlines get met so that you the player have the best time possible. Tournament Hotels are available, so check it out. Advantage of staying in the tournament hotels is transportation (ie) not having to rent a car! (spend more money) they tend to sell out, so hurry! Rooms Thursday check in and Sunday check out are available! 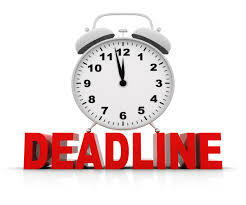 Registration Deadlines: There are deadlines for singles, doubles, teams, when to turn in a roster, extra coach fee, and turning in media information. NCTTA Alumni Committee is chaired by Kaylee Ho and one of its members Cyrus Aga (Western University NCTTA Alum) has spearheaded this creation, enjoy! 1. This database contains the confidential and personal information of NCTTA alumni. Circulation of this material outside the NCTTA network is strictly prohibited. 2. Do not attempt to spam or repetitively email alumni if they do not respond to your introductory emails. Many of the alumni work in different time zones and may not have the ability to instantly respond to introductions or phone call requests. 2019 NCTTA tournament experienced equipment sale - check out the price list here! Free 1 DF scoreboard for each member schools, while supplies last. 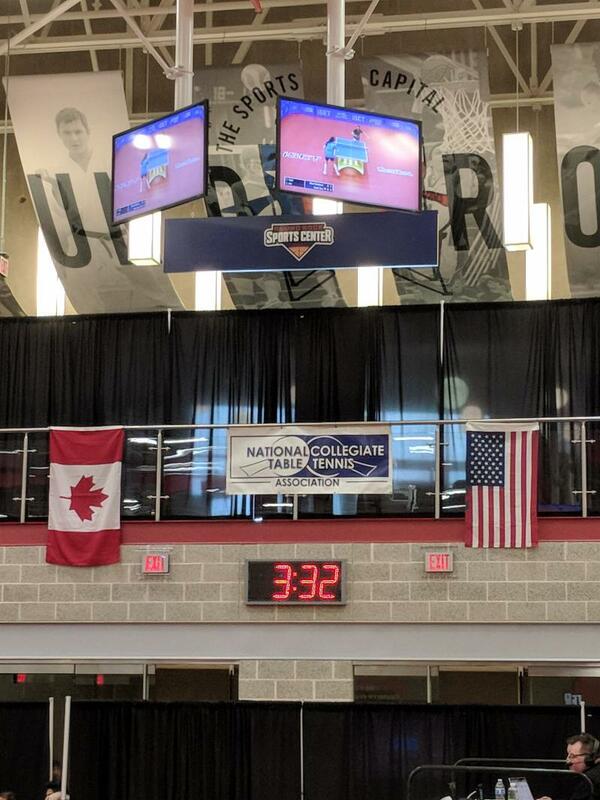 NCTTA Board of Directors are excited to announce that the NCTTA College Table Tennis Championships in 2020 will be heading back to Round Rock, Texas the sport capital of Texas! Round Rock CVB had the honor of hosting us in 2016 and 2018 and now again in 2020. Nancy Yawn, Director of the CVB states, "We have been honored to host the Championships in 2016 and 2018 and it was a great experience!" A great experience indeed as Round Rock, Texas continues to be a popular spot for the College Tale Tennis Championships. NCTTA looks forward to April 2020 in Round Rock! 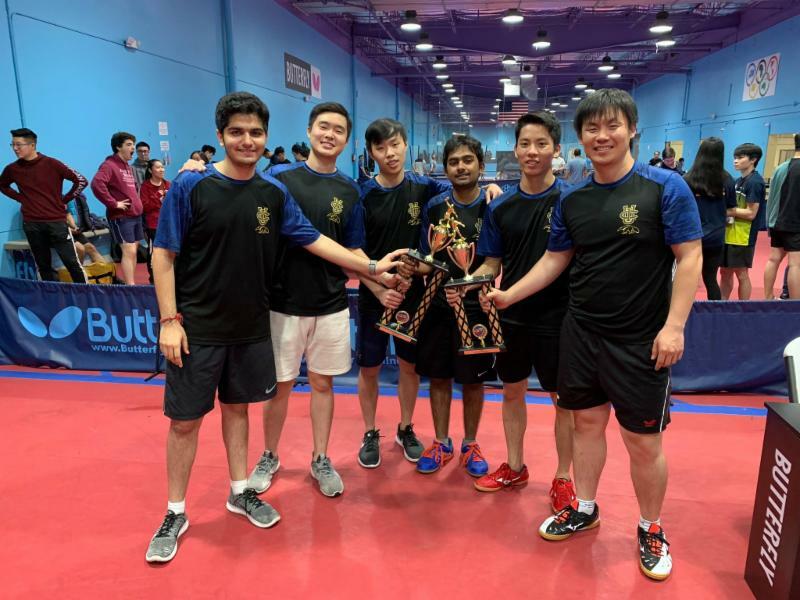 Pillar College's coed table tennis team made noise and advanced to a fourth-place finish at the 2018 NCTTA championships in Texas. Only squads from NYU, Texas Wesleyan and Mississippi College were better last season. With help from Coach Lily Yip, the small private school in New Jersey should make noise once again at the 2019 NCTTA championships in Greensboro, North Carolina. Members of the team at the small Christian college based in Newark, New Jersey play the game with passion. Pillar Panther players scored a big triumph at the Pennsylvania divisionals on January 26. Snow was on the ground at host Penn State that day as the potent Pillar squad led by standouts Kaden Xu and Charlie Jiang rose to the top. Pillar knocked off foes like Penn State, Pittsburgh and the University of Pennsylvania. Kaden Xu, 20, who is 3rd ranked in the USA, grabbed first place in men's singles with teammate Jiang taking 2nd. Both players live in Piscataway, New Jersey. They were Pillar freshmen competing at the 2018 NCTTA nationals in Round Rock. They should return to wow fans at the final tournament of the collegiate season in North Carolina April 12-14. Pillar's solid performances at PSU's Happy Valley in late January delighted Coach Lily Yip during a very hectic year for the former Olympic star. How busy a year for Lily? As February spilled into March, Lily Yip stayed on the go campaigning for a USATT position to get elected as an at-large board member. She brings much experience to the table. Lily is a former USATT board member. A native of China, Lily immigrated to the United States, became a citizen and played twice on USA table tennis teams in the Olympics. She also played in three Pan American Games, and 7 World Championships. She was named USATT Coach of the Year four times. Those are just a few of her career highlights. In 2010, Lily and her husband, Barry Dattel, opened their own club, the Lily Yip Table Tennis Center. And the fabulous New Jersey club continues to go strong. Lily's club hosted tournaments, coached beginners, launched programs for senior citizens and much more in the Garden State. The club staff has assisted underprivileged people in the community. If elected to the USATT board this year, Lily Yip promises to revitalize its fund raising to help with national team programs. She wants to increase professionalism in the sport of table tennis for players, coaches and promoters. Lily seeks to step up opportunities for Para Athletes, too. "We can make a difference in the world through the beautiful sport of table tennis,'' Yip says. Lily is already making a difference for Pillar College after becoming a player-coach at the New Jersey school in year one. Now in its third season, the red and black of Pillar seeks to soon shine at the 2019 Nationals in North Carolina. Pillar first landed on the USA's table tennis map with a strong showing at the 2017 national championships in Eau Claire, Wisconsin. Wisconsin people are well-known for making delicious cheeses for more than 175 years. Dubbed Cheeseheads, fans of the NFL's Green Bay Packers are everywhere in the Dairy State. The University of Wisconsin's table tennis team has landed on the map, too. Traveling from their home turf on the Madison campus, the Wisconsin Badgers coed team marched to triumph at the NCTTA Midwest Regionals in late February. Players from talented college teams didn't let the winter cold, snow & ice stand in their way during the February 23-24 tournament at the University of Iowa. Clearly, players from Wisconsin's coed team stayed on fire with paddles blazing during the event at the Iowa Hawkeyes Fieldhouse. When all was said and done in Iowa City, Wisconsin Badgers captured the trophy as No. 1 team. Wisconsin table tennis teams are obvious winners when it comes to their favorite Olympic sport. Wisconsin's coed and women's teams have ranked among the USA's top 25 squads every year since things got started on the Madison campus in 2006. 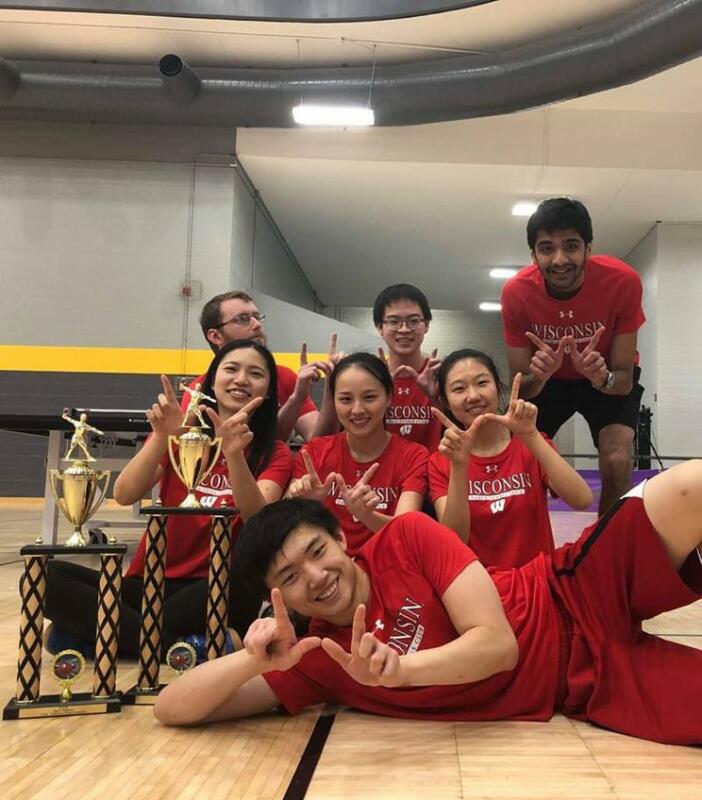 With the Midwest Regionals trophy in their hands, Wisconsin Badger players next prepare for the 2019 ISET College Table Tennis Championships in Greensboro, North Carolina. 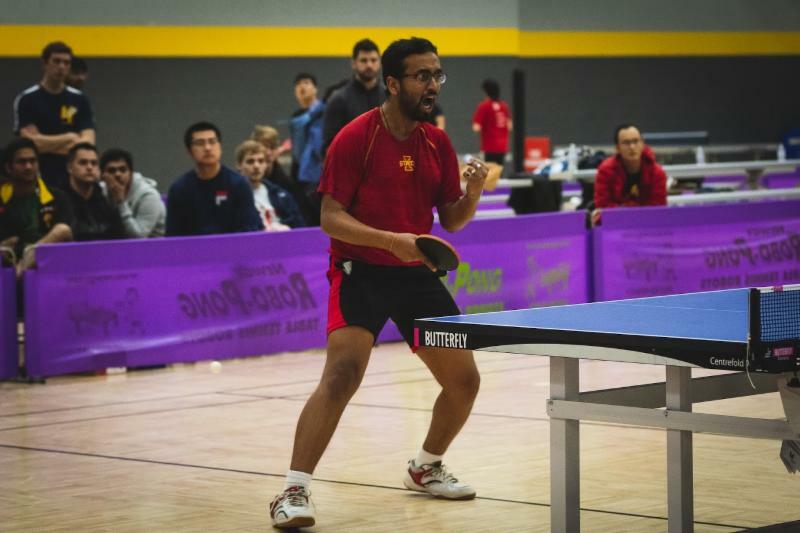 Nearly 300 of the best college table tennis players in the USA and Canada will stay in the spotlight at the NCTTA's biggest tournament of the year. There were some big upsets. 7th seed Iowa State beat the University of Illinois at Champaign-Urbana, a No. 1 seed. Wright State's coed team beat the University of Illinois-Chicago. The U. of Toledo (an 8-seed) beat Ohio State (a 4-seed), among others in coed ranks. Iowa State landed in 2nd place with strong showings by Ved Prakash and Jikang Qu. Rajan Hirani of Wright State played his heart out to score a dramatic 12-10 win over Toledo so his school from Ohio punched its ticket to Nationals. Midwest Regional Director Dennis Yanga said weather was a problem for a couple of teams heading home. University of Minnesota players and Minnesota Division director were delayed arriving due to a blizzard in the Minneapolis area. After the two-day regionals in Iowa, Northwestern Coach Ned Leuchtner looked back on his squad's accomplishments during the 2018-19 season. Other schools competing in the tournament had positives to report. But Godil and two other UIC teammates will compete in singles at the Nationals in North Carolina. I currently work in private equity and focus on global infrastructure investing. Prior to this, I spent several years in investment banking. I enjoy the challenge of continually pushing my analytical capabilities everyday. I also have the opportunity to travel across the world and work with extremely motivated individuals on a daily basis. If anybody has any questions about careers in the finance industry, please do not hesitate to reach out! I'm involved with the NCTTA Alumni Committee and in my free time, I like to travel as much as I can. Network as much as you can and take advantage of the NCTTA alumni network! 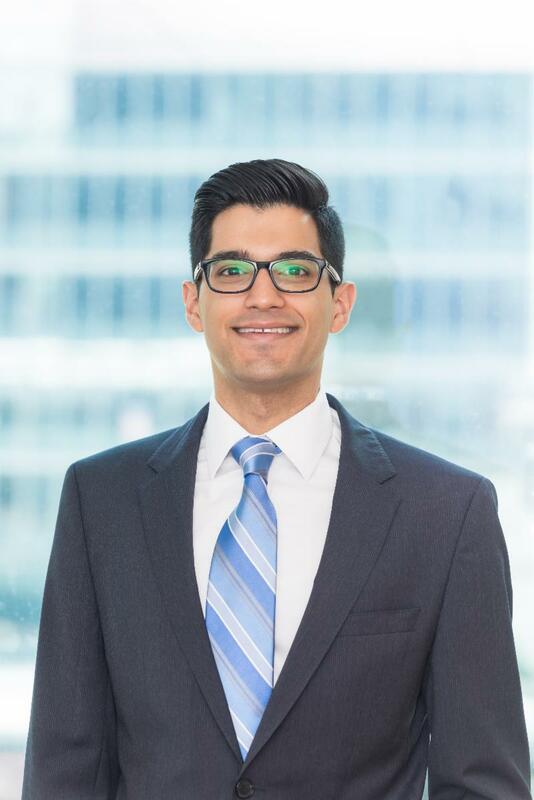 My very first internship in finance was through a mutual admiration for table tennis (fun fact: me and my boss ended up playing a game of table tennis right after my internship interview - I had no idea that there was a table tennis table hidden away in their office!). The friendships that I formed from the NCTTA network are some of the strongest relationships I have to-date. I loved every minute of being an NCTTA athlete. The feeling of getting ready for our team's weekly practices and knowing I would enjoy every second of practice is something I will never forget. 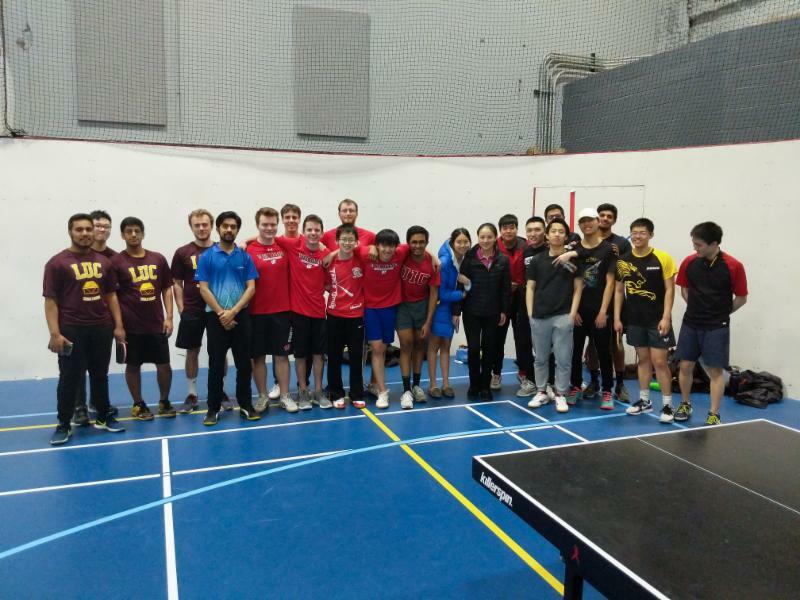 Maryland and Pillar College are very familiar with each other in college table tennis. Both schools have standouts in both programs making them favorites for any competition they enter. Pillar College, winners of the NCTTA Pennsylvania division, and Maryland, who were winners of the NCTTA DC division, were the "familiar foes" of the competition. Brandon Lawrence, part of the Regional tournament staff had this to say about the event, "For the second year in a row, the Mid-Atlantic region came down to the University of Maryland and Pillar College. Led by Kaden Xu our regional Men's Singles Champion, Pillar College had won all of their matches in doubles to advance to the final. 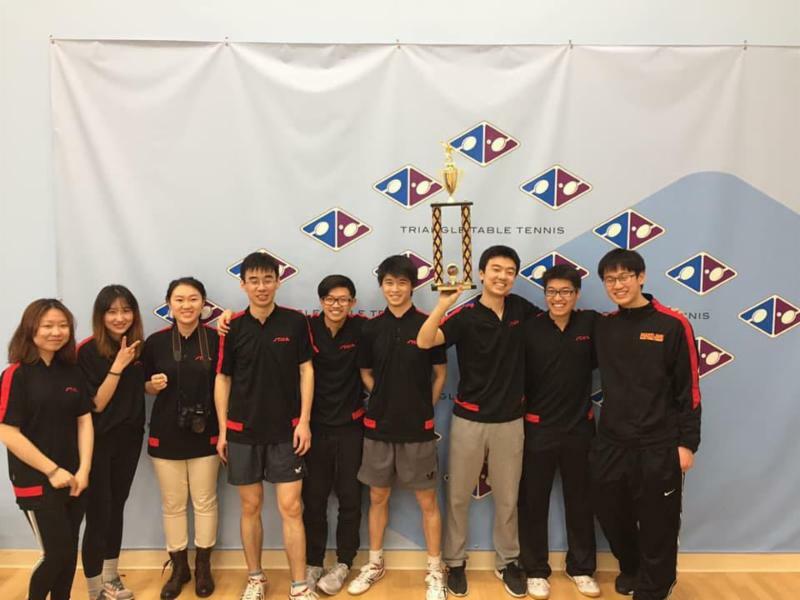 Maryland, led by the team of Nathan Hsu and Rui Xu, faced them in a deciding doubles match. Down 2-1, Maryland came back and won the last two games to win the region. This was the second year in a row Maryland upset Pillar to win the Mid-Atlantic regional." Both schools are headed to the National Championships in Greensboro, North Carolina. 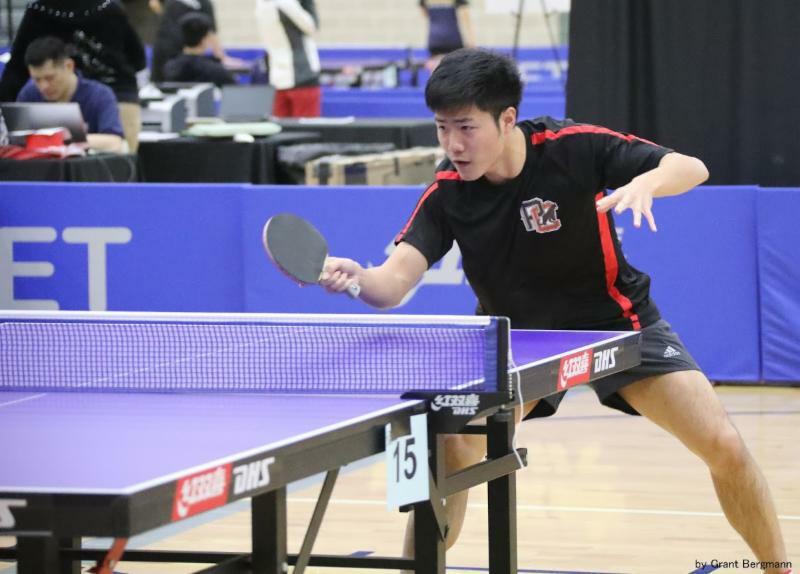 Keep in mind Kaden Xu #1 player for Pillar College is also the highest ranked player in all of College Table Tennis and should be a contender to win it all! Women's teams to qualify are Duke and UPenn as well. When it comes to table tennis, the University of California's women's team on the Berkeley campus always plays the game with passion. The Lady Bears are pretty successful as well with the Cal ladies recently finishing No. 1 at the NCTTA's West Regionals. Led by stars like Lily Zhang of Team USA fame at the Olympics, the Cal Berkeley women have been tough to beat in recent years. So it was really no surprise that the Lady Bears table tennis players captured the West Regionals trophy to punch their ticket to the 2019 national championships in Greensboro, North Carolina. Zhang was the women's singles collegiate champ in 2017, among her many honors during her awesome career. In 2018-19, the Cal team features the talents of several outstanding players like Angela Guan, 20, of San Jose, and Ying Wang, 24, an economics major from China. Ying Wang was a standout at Ohlone Community College in California for two seasons before transferring to Cal-Berkeley. In California, Major League Baseball teams like the Los Angeles Dodgers are strong year after year. That's true as well for the Cal-Berkeley women in table tennis. Prior to the 2018 national championships, the Cal Berkeley women were ranked No. 2. Texas Wesleyan University's women's team ending up winning at nationals in Round Rock, Texas last season. On the men's/coed side, the new king of the NCTTA's West Regionals is the University of California at Irvine. Some observers call it a surprise. But others who follow table tennis closely like Leparulo are quickly turning into believers. For those who don't follow Cal-Irvine, UCI was founded in 1965. Located in Southern California, the school today enrolls more than 30,000 students. It is the largest employer in Orange County. The UCI school mascot is the Anteater. The UCI baseball team plays its home games at Anteater Ballpark in Irvine. When perennial national champ Texas Wesleyan University battles rival Mississippi College, the table tennis matches are always awesome. That was certainly the case when the Texas Wesleyan Rams on their home court faced a rugged MC Choctaws team at the NCTTA's South Regionals in Fort Worth. When all was said and done on March 9, MC's coed team edged Texas Wesleyan 3-2. Fans on both sides at the Sid Richardson Center witnessed some spectacular spins and shots that Saturday in the Lone Star State. MC won the first-place trophy when Texas Wesleyan standout Jinxin Wang of China was unable to compete in doubles matches after suffering an injury. Games were tied at 2-2 when Texas Wesleyan Coach Jasna Rather made the announcement to the crowd that her doubles team defaulted. Jinxin was hurt towards the end of a thrilling match with Mississippi College ace Qingwei Sun of China. Following a timeout, Wang returned to finish the match, but was defeated. He was done playing for the night. The Texas Wesleyan graduate student returned to compete in singles games Sunday. No doubt, Mississippi College and Texas Wesleyan teams will meet once again at the NCTTA national championships in Greensboro, North Carolina April 12-14. At the South Regionals, the University of Texas Longhorns coed team got third place honors and is also qualified to go to Nationals. The University of Texas at San Antonio was the fourth-place finisher. Texas Wesleyan University has won 69 national championships in table tennis since the program's inception in 2002, including 13 coed titles, 8 women's titles and much more. At the South Regionals, the powerful Texas Wesleyan Rams women's team got first place. And several of the TWU aces were saluted for winning singles titles. 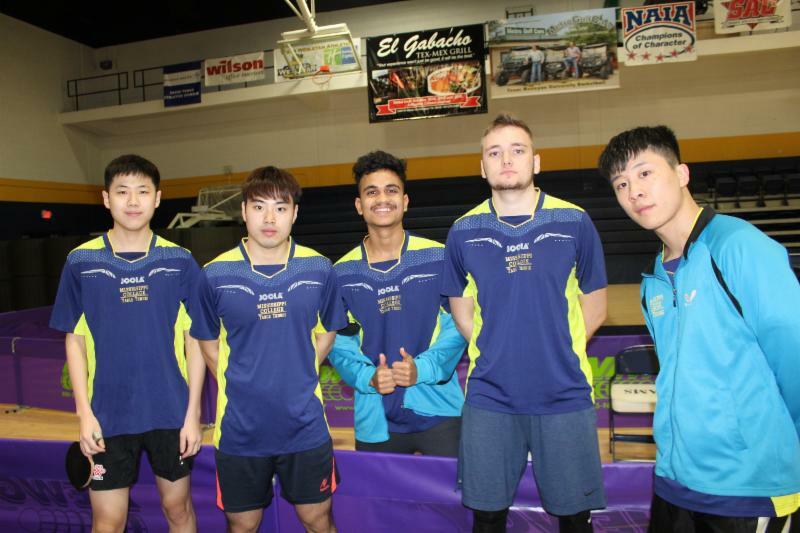 The Mississippi College coed team consists of Captain Harry Sharma, and Tomotaka Yoshitomi, both of Japan, Qingwei Sun and Xiang "Ali'' He, both of China, along with Vlad Totkalo of the Ukraine. Jeremy Gore of Dallas and Caleb Shipman of North Carolina round out the Choctaws squad. Totkalo got 2nd place honors in singles games at the tournament's final day, March 10. MC is in its 12th season of table tennis and has been to the national championships every season. The Dixie Division champs, Mississippi College defeated squads like South Alabama (the No. 2 team in divisionals) before facing Texas Wesleyan in the South Regionals finale. With players from Peru, Bangladesh and Alabama, South Alabama's team was excited to receive a wildcard invite to the tournament. Other teams making the road trip to the South Regionals included Florida State and Texas Tech. There should be some exciting matches at the 2019 national championships in North Carolina with South Regional teams heavily represented. At the 2018 NCTTA championships in Round Rock, Texas, Mississippi College's coed team finished third at the 2018 NCTTA championships. New York University finished first, while Texas Wesleyan University took 2nd place. On the No. 1 women's team at South Regionals, TWU sophomore Ana Aleksandric, 20, of Belgrade, Serbia is more than a terrific player. She's a bright computer science major on the Fort Worth campus. "Our goal is to win another championship,'' Ana said with the nationals coming up in North Carolina. Her brother is a former Texas Wesleyan table tennis player now pursuing a doctorate at the University of Texas at Arlington. Back home in Serbia, Ana's mom, Vesna, and dad, Dean, enjoyed watching their daughter compete via live streaming of the NCTTA's South Regionals in Texas. Two first time teams to Nationals have earned the ticket out of the Midwest regionals played on February 23 at the University of Iowa. Iowa State University and Wright State University battled their way with many upsets and #loudnproud moments in the process to make it through as second and third place teams respectively, thus directly qualifying for the NCTTA champs April 12-14 in Greensboro, NC. Iowa State has a roster of 6 players with an average rating of 1900 for the top four players. They hail from China, Malaysia, India, and the USA, with all members majoring in STEM subjects. 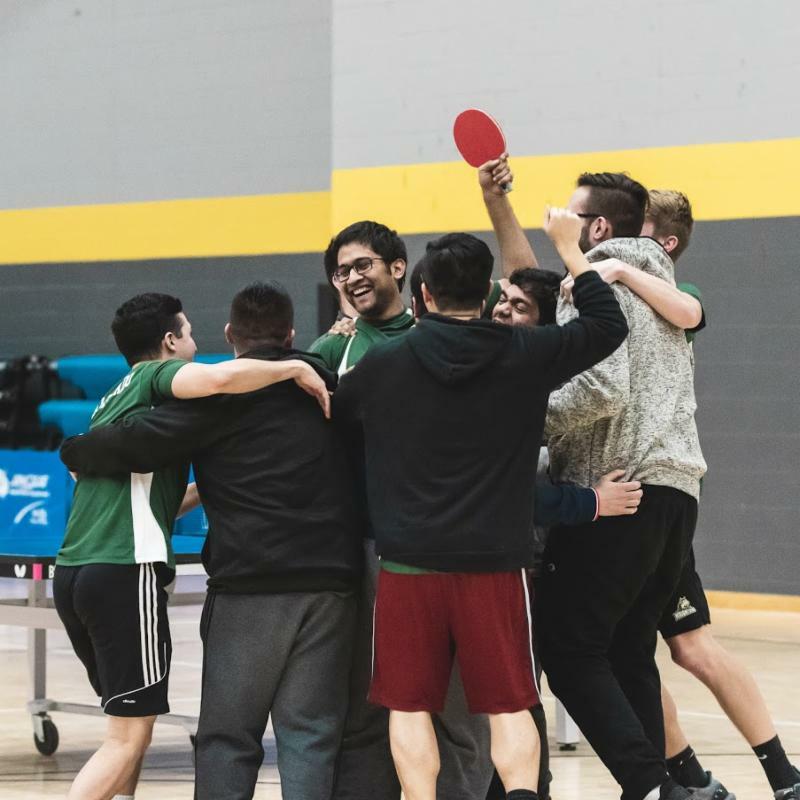 Wright State University has players of varying nationalities such as India, China, and the USA, with members studying diverse subjects such as Biomedical Engineering (Juan Maldonado, the top player), Statistics (Rajan Hirani, the number two player) and much more. "In our round robin group we were able to place first after taking down Iowa State. We were barely able to make it to doubles after we won the 4th match in a close 5 gamer with Sandeep winning 11-9 in the fifth with our team cheering very loudly after every point. Rajan and Juan killed it in doubles and we were victorious. We then advanced to play University of Illinois-Chicago. We knocked them out in doubles because Josh Cabay [1850 rating] played out of his mind and took down a 2100 player. We then advanced to the semifinals to play Wisconsin where we lost 3-1. Lastly we were finally able to take down our rival Toledo, also from the Ohio west division, in the third place match 3-1 so we could advance to nationals." According to Iowa State team captain Jikang Qu, after losing to Wright State in double's, his team switched up their strategy of who would pair up together in case a tiebreaker occurred again. They knocked out top seed University of Illinois- Urbana Champaign in a nail-biting five game double's match 18-16 after being down 6-10! Jikang remarks, "Beating the top seeded team in that fashion raised the confidence of our entire team and that inspired us to defeat University of Toledo in the semi-final, which had another one of the close doubles matches..."
How are the respective qualifying teams preparing mentally, physically, (and financially!) for the Nationals? Well according to Jikang of Iowa State, his team is resting a little bit after such a hard fight at regionals, but then it will be back to the practice hall for work on drills and technique. Trevor states, "We are practicing hard both mentally and physically in order to try and perform well on the national stage." Ultimately, they are focusing on training instead of playing actual games. And when it's dealing with funding for the nationals, a somewhat expensive venture, Iowa State has half of the costs paid for by their student government, as well as looking into other opportunities for raising more money that have not been realized yet. For Wright State University, Trevor says they are conducting "bake sales and a crowd funding page we are trying to set up now." Wright State at moment of Qualification! Congratulations to both teams qualifying for nationals for the first time, and the best of luck to you both in Nationals! Several National Championship bound schools and schools in the area got together for some scrimmages or friendly tournament competition! "We teamed up with the Confucius Institute at the University of Toledo and they sponsored our event. There were trophies given out to 1st to 3rd places. University of Akron, Ohio State, University of Michigan, University of Toledo, Case Western Reserve, Wright State and Wayne State were among the participants!" University of Illinois at Chicago also hosted their own Pre National Tournament scrimmage with UW Madison and Loyola University. Basically what it looks like for the rest of College Table Tennis is that the Midwest schools are no joke-you have been put on notice!